Pictured, Pictured, Greensboro, North Carolina, Western Guilford Middle School substitute teacher, Paul A. Stennent. Screen shot. 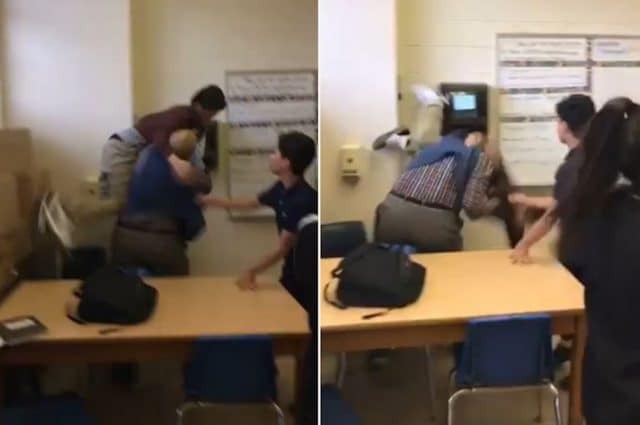 Jose Escudero body slammed: Paul A. Stennent a Greensboro, North Carolina, Western Guilford Middle School substitute teacher fired after disciplining middle school student. Paul A. Stennent a 49 year old substitute teacher at a Greensboro, North Carolina school was fired last week following video showing the middle school educator body slamming one of his students. 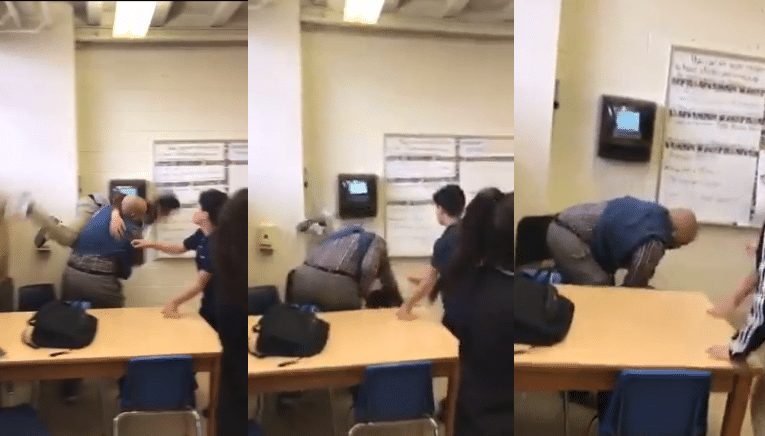 The video, which was reportedly taken on Wednesday, shows a confrontation between the Western Guilford Middle School substitute teacher, and 12-year-old student Jose Escudero. Escudero told Fox 8 that the ‘incident’ was preceded by a disagreement over a box of Valentine’s Day chocolates that he’d brought to class that day, with Stennett confiscating the candy and placed it in the sink. When Escudero went to retrieve the chocolates at the end of class, Stennett tried to stop him, attempting to grab the box away from boy and grabbing him by the front of his shirt. Stennett then allegedly pinned the child against the wall before throwing him over his shoulder and slamming him onto the ground. The clip which has since gone viral, was shared on Facebook on Friday by Escudero’s mother, Mayo Corrales, who says her son was suspended for seven days due to the incident. Tina Firesheets, a spokesperson for the Guilford County Schools district has since revealed that Paul Stennett is no longer working for the district. The substitute teacher first began his employment on December 19. Responding to the video, Greensboro local police said they had yet to decide whether to pursue charges. ‘The video does not capture the entire incident,’ Susan Danielsen, Public Information Officer for the Greensboro Police Department told the dailymail on Monday. The Escuderos plan to now pursue legal action against the school and the teacher. Paul A. Stennent fired: Social media responds. And then there were these comments on the web that caught this author’s attention, see what you think?